In the northern part of Maryland bordering on the southern part of Pennsylvania lies Frederick County. The presidential retreat known as Camp David is located in this county within the Catoctin Mountain Park. It is also home to the US Army’s Fort Derek facility. Frederick County is also considered part of the Washington Metro area. Frederick County is managed under the County commissioners governing body. It has a population of approximately 234,000 residents occupying 667.34 square miles of land. In terms of land mass, this county is the largest in Maryland. The County seat is also called Frederick; historical figures such as Francis Scott Key and Thomas Johnson made their home here. The topography of the area is varied, for example Frederick County incorporates the boundaries of Piedmont Plateau as well as the Appalachian Mountain. The two prominent ridges, Catoctin Mountain and South Mountain, form an extension of the Blue Ridge Mountain range. A current overview of the real estate market in Frederick County shows a significant improvement over the last two years. Although the rise in market value has tapered off somewhat, forecasters are predicting the steady increase will continue over the next 12 months. 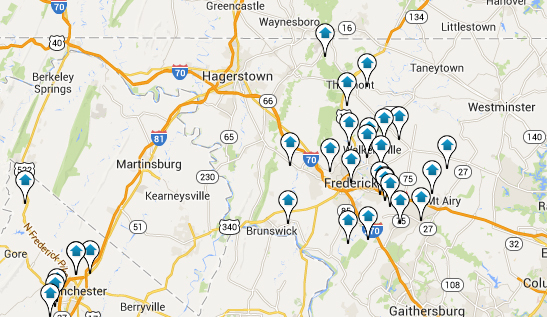 This is a good time to take a closer look at Frederick County as a hot prospect for a home purchase.